Elected to the National Baseball Hall of Fame in 1980, Duke Snider won two World Series Championships with the Brooklyn and Los Angeles Dodgers and was a eight-time All-Star selection. Snider still holds the record for most home runs in the World Series from a National League player with 11 and has his number 4 retired by the Dodgers organization. 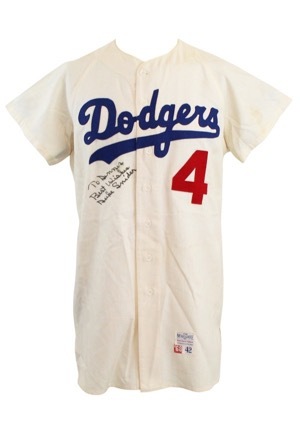 Offered is a beautiful home flannel jersey from Snider’s coaching tenure with the Dodgers in 1968. 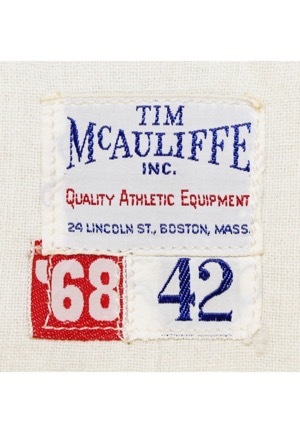 On the front left tail is the McAuliffe manufacturer’s tag with two box tags attached reading the size “42” and year “‘68”. Across the chest reads “Dodgers” in script style writing. 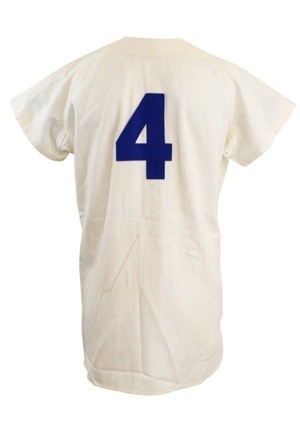 On the back is the coach number “4”. These are done in Dodger blue felt. On the front adjacent below the team name is also the coach number “4” done in red felt. 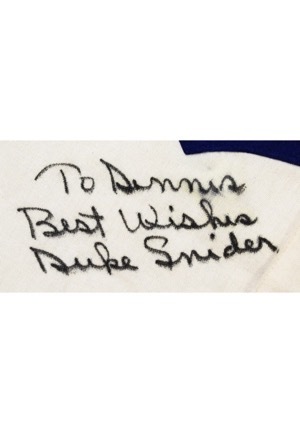 Snider signed the front of the jersey in black marker with the added inscription “To Dennis Best Wishes” and in our opinion the signature rates an 8. This jersey is properly tagged, was presented to us as coaches-worn and shows light wear and remains in beautiful condition. Accompanied by a LOA from PSA/DNA.